Forsythia. Yellow Bells. Golden Bells. 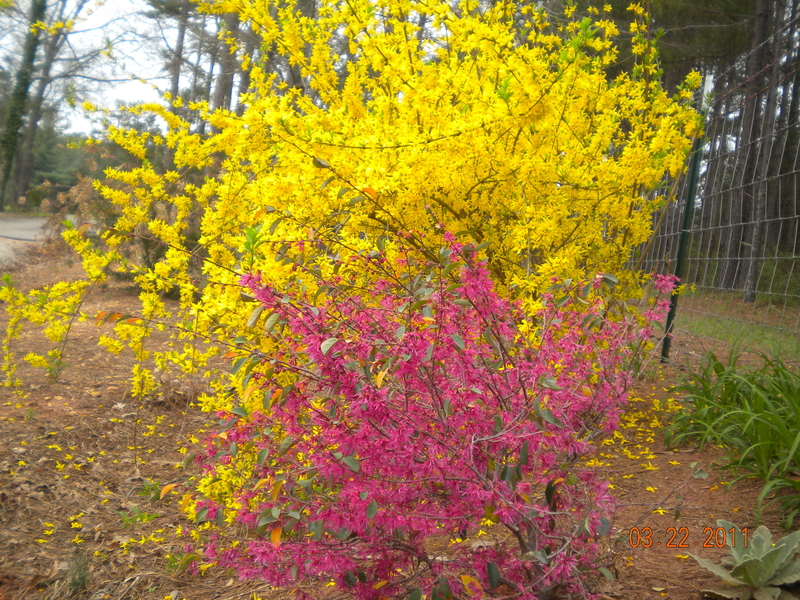 An early flowering deciduous shrub with bright yellow blooms opening before the leaves appear. Blooms: Profuse flowers 1-2 inches are bright golden yellow bell shaped, appearing anywhere from January to April, depending on the mildness or severity of the winter. Foliage: Oval bright green leaves with serrated edges appearing later once the flowers have opened. Mature Size: 10 feet tall and just as wide. Size Shipped: Gallon/6.5 inch pot. Shipped without pot. Not native - originated in China. Site: Full sun or light shade. Moisture: Drought tolerant, once established. Easy to grow. No known pests. Suggested Companions: Loropetalum makes an excellent companion since bloom time is the same.